It’s the first day of spring and all I can think of is two words: glowing skin. “But Huong, I have oily skin. I’ve tried to get that glowy look, but my kind of glow ends up making me look like a greasy mess.” you say. Well, my friend, I get you. I’m a recovering oily-skinned person myself. And yes, just when I think I can get that dewy, glowy skin like Olivia Culpo and Camila Coelho, I look in the mirror only to see that I look like I stood in front of the fryer at McDonald’s…all day. For today’s post, I’m going to share my glowing skin tips with you. Some of the tips I share today are a “duh”, but I really want to drive these home and also give you a testimonial on how to get naturally glowing skin in 2-3 weeks. On top of that, I’m going to share how to get glowy skin with some of my tried and true makeup products. Let’s dive in! This tip is a duh for everyone who knows what “beauty sleep” truly means. Sleep doesn’t just give us energy to keep going, but sleep allows our bodies to repair itself. As we sleep, it’s a time when our bodies are at work. Whether it’s a zit, a cut, sun damage or dull skin, sleep is the free way to get the health of your skin back on track. The more sleep we get, the more time we give our bodies time to heal and repair itself! I’m pretty sure that sleep is how we get glowing skin overnight! As for exercise, make sure you’re getting some kind of physical in for the day. Whatever your workout is, the movement just helps your body to detox. And when your body detoxes, you not only feel better, but you look better! My favorite way is to sweat at the gym or go running. I CANNOT stress this enough! If you do not want to age fast, wash your face! I don’t care if you’re tired. Take two minutes to wash your face. Like last night, I fell asleep on the couch and didn’t wake up until 5:45am. I still got up, washed my face and went back to bed even if it was for a few hours. Even if you don’t wear makeup, wash your face! When you’re out and about, your skin picks up free radicals like cigarette smoke, car fumes and debris from the air. So when you go home and hit the hay without cleansing your skin, you’ve just put all that nastiness on your pillow. Ew. Two minutes is all it takes to cleanse and put on product based on your needs. Trust me. Your future you will be thankful. Your hands pick up bacteria from all over the place: your phone, keyboard, steering wheel, door handles, etc. When you touch your face with unclean hands, you could leave bacteria on it that will clog your pores. And what do you get? Yep. Zits. Refrain from touching your face so it’ll be one less thing for you to worry about! For me personally, my skin lets me know when it hates (or likes) something. So I did an experiment to take notice on how my body reacted to certain foods. You know what my skin hates? Hershey’s chocolate (yes, this very brand – don’t ask me why), fried foods, soda, and lots of cheese. When I eat even a small square of Hershey’s chocolate or even a few sips of soda, you can bet I’ll break out the next morning. My greasy forehead is an indication of intaking too much fried foods. And with cheese, as long as it’s not excessively, my body is happy. As for what my skin loves? Lots of greens like kale, avocado, edamame, Brussels sprouts, etc. I ate kale salads three weeks in a row and realized one day that my skin looked like it was Photoshopped, haha! It’s important to pay very close attention to what your body likes and doesn’t like. Because what you eat really does show up on your skin. I’ve been taught my scientist and doctor friends that our health begins with our gut. The state of our health can be traced back to our gut health. So whenever you have pain, headaches, certain illnesses, it’s most likely that your gut isn’t in the greatest health. To improve my gut health, I’ve been taking probiotics in the form of a powder for close to six years now. And recently, I’ve increased my intake from a few times a week to every other day. My skin is definitely happy because I can tell a difference! This tip I’m giving you is one I’m very terrible at and am currently working on. You can ask my friends. I’m not good at drinking water. I know it’s not an excuse, but I can taste the difference between various water brands so I can’t drink water unless it’s Core, Fiji or Voss. And I know this sounds weird, but even though they’re my favorite water brands, I have to have lemon or I can’t down it. And I get sick drinking water from restaurants. My stomach bloats and I get cramps. Don’t ask me why. It happened enough times for me to notice. The average amount of water our bodies are made of is around 60% so it only makes sense if we drink plenty of water. One of my bestie drinks lots of water and let me tell you, her clear skin is proof that our bodies need it. My dry and flaky hands tells me I need to keep working on it, ha! Taking vitamins is essential to give our skin that extra edge for it to look it’s best. For me, I also take pharmaceutical grade fish oil, vitamin C (to reduce inflammation) and prenatals. When I don’t take my vitamins, I notice the difference in my energy and my skin tone is very dull. If you have the extra funds, I highly recommend you take good vitamins to get glowing skin naturally. Give your body the vitamins and nutrients it needs that you can’t get from food (trust me, you can’t get 3-5 servings of vegetables a day) and you’ll be glowing in no time! And no, gummy vitamins don’t count. Feel free to fight me on this. Now for the fun part: beauty products! 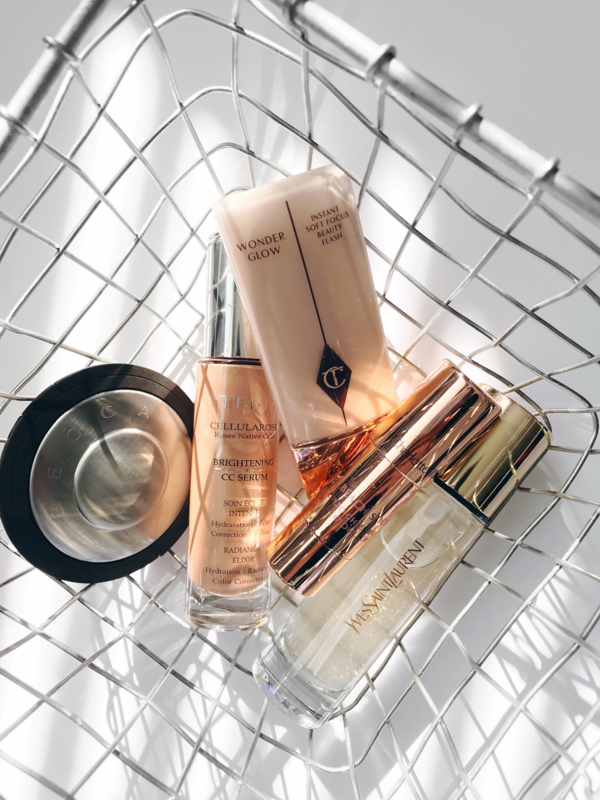 This past fall, I shared my favorite foundations for oily skin so this spring, I wanted to share with you 5 must-have glowing skin products for glowy skin. Swipe and swipe and you’ve got natural looking flush-colored cheeks! I’ve used chick sticks before and they last FOREVER! So if you’re a creature of habit, this product is probably for you! I add a little bit of this to my moisturizer if I want to keep my routine quick. Otherwise, I add some of this product to my foundation for that extra glow. Put this highlight in all the right spots and it’s like the sunlight was meant to hit you in all the right places! This shade goes well with a lot of skin tones and gets fantastic reviews! The primer of all primers. This blurs your pores like no other. I haven’t done this yet, but I imagine pairing this primer with the product I’m about to talk about below and you’d be golden. See what I did there? Very pricey, but trust me when I say it’s worth every penny! When I put a pump or so of this product on my face, it looked like I had just returned from a tropical vacation! It’s like magic and I’m completely okay with sharing this product out of my hat of skincare tricks! I know I’m no Lydia Millen-Gordon, but I strive to achieve glowing skin like her’s! I hope today’s post helps you in some way to get that glowing skin you want! What’s one thing you’ll be working on or purchasing to get naturally glowing skin?! If you also have any skincare secrets, let me know in the comments! Please note that what’s written in this post is my opinions based on my experiences. I understand that everyone’s skin and health is different so this content should not be used for diagnosis or treatment of a health problem or disease and serves as informational purposes only. Always consult a professional healthcare provider such as a dermatologist with any questions you may have.